Details: This lovely portrait of a striking looking lady dates from c1825 - judging from the dress and hairstyle - and has all of the Carpenter characteristics, particularly her fondness for featuring velvet in sitter’s gowns. The lady is not identified, but is married, aged about 40, and appears to be from a prosperous, possibly aristocratic, family. Probably one of the most important women artists of the 19th century, Margaret Sarah Carpenter followed the tradition and technique of Sir Thomas Lawrence in her portrait work. The portrait is attributed to Ms Carpenter, perhaps the most important female painter of the 19th century. In recognition of this fame she was given a pension of £100 p.a. by Queen Victoria on the death of Margaret’s husband, William, who was Keeper of Prints and Drawings at the British Museum. 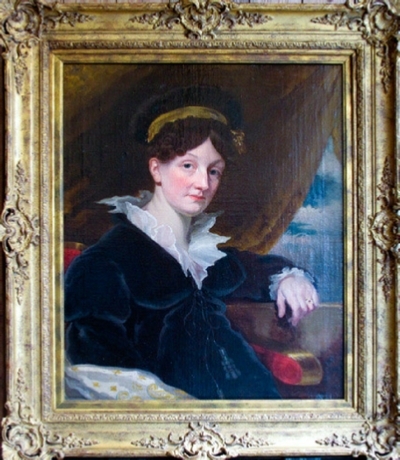 Born Margaret Geddes in Salisbury, she came to London in 1814 and married her husband in 1817, by which time, although still very young, she had already established a reputation as a fashionable portrait painter. She exhibited at the Royal Academy from 1818-1866, also at the British Institute and Suffolk Street. Three of her portraits are in the National Gallery, including one of Richard Parkes Bonington. Her portraits follow in the tradition of Lawrence, but with a feminine touch - she was particularly fond of featuring velvet in her sitters’ gowns, as in this work. Regrettably, the provenance is unknown, which is especially sad considering the fine quality of the work executed at the height of the artist’s career. The canvas was relined in the late 20th century.